We Offer two different Coupling style timing devices. The main difference between the two items ids the degree of accuracy. Both are made in the USA by Candy Controls. 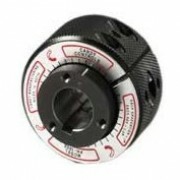 The Phasing Hub is a static phase adjusting coupling designed for precise angular displacements. 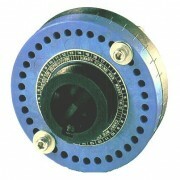 When in motion, the Phasing Hub operates as a rigid 1:1 shaft coupling. Phase change of the coupling and connected shafts is accomplished with the drive stopped. By manually turning the Adjusting Ring, the Phasing hub becomes a phase changing device providing infinitely variable and stepless phase correction in either direction. 1 rotation of the adjusting ring results in 3.6° of adjustment. The Candy Timing Hub is the low-cost positioner used to positively lock gears, sprockets, cams and levers to shafts while still providing full adjustable timing control. This precision timing hub allows the use of low-cost plate sprockets and hubless gears, and eliminates the cost of machining special slots or clamps often used for timing adjustment. These savings and the low-cost of the hub, clearly show that the Candy Timing Hub is the most economical way to provide positive and accurate positioning control.